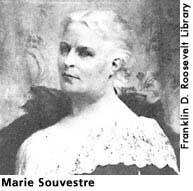 Marie Souvestre, one of the most important intellectual influences of Eleanor Roosevelt's youth, was born in 1830 in France. An educator known for her high academic standards and liberal political beliefs, Souvestre founded and ran schools for the daughters of the prominent European and American families in both France and England. The best known of these was Allenswood Academy in England, which ER attended from 1899-1902. While at Allenswood, Eleanor became Souvestre's protégé. For ER, orphaned at a young age, Souvestre was a combination of teacher, mentor, parent, and friend as well as the model of a fiercely independent woman. She instructed ER in French, all the while encouraging her to become more confident in her abilities and to express her personality. The two were extremely close, and ER credited Souvestre with forming both her character and her intellectual outlook. ER thrived on Souvestre's intellectual method, which stressed rigorous analysis and independent thinking. She also responded to Souvestre's humanism and commitment to human justice. Watching Souvestre fight for seemingly lost political and social causes, Eleanor wrote many years later, "I think I came to feel that the underdog was always the one to be championed." (1) Souvestre also introduced ER to the settlement movement (privately funded inner city institutions that provided education and social services to immigrants and the urban poor), which Eleanor later became part of through her work with the Rivington Street Settlement House in New York City. In addition, Souvestre also taught ER the pleasures of independent travel, which gave ER great confidence and influenced her own subsequent love of travel. ER wanted to stay on at Allenswood for another year, but her grandmother insisted that she return home in 1902 to make her debut in society. Eleanor complied, but she and Souvestre maintained a correspondence until Souvestre's death in March of 1905. Thereafter Eleanor kept Souvestre's portrait on her desk and carried her letters with her. Eleanor Roosevelt. "The Seven People Who Shaped My Life," in Allida Black, ed., What I Hope to Leave Behind: The Essential Essays of Eleanor Roosevelt (Brooklyn, N.Y.: Carlson Publishing Inc., 1995), 40. Black, Allida, ed. What I Hope to Leave Behind: The Essential Essays of Eleanor Roosevelt. Brooklyn, N.Y.: Carlson Publishing Inc., 1995, 39-40. Burns, James MacGregor and Susan Dunn. The Three Roosevelts: Patrician Leaders Who Transformed America. New York: Atlantic Monthly Press, 2001, 88-89. Caroli, Betty Boyd. The Roosevelt Women. New York: Basic Books, 1998, 248-252. Cook, Blanche Wiesen. Eleanor Roosevelt: Volume One, 1884-1933. New York: Viking Press, 1992, 103-116. Lash, Joseph. Eleanor and Franklin. New York: W.W. Norton & Company, 1971, 80-85.